Review - Beautiful LEGO Wild! 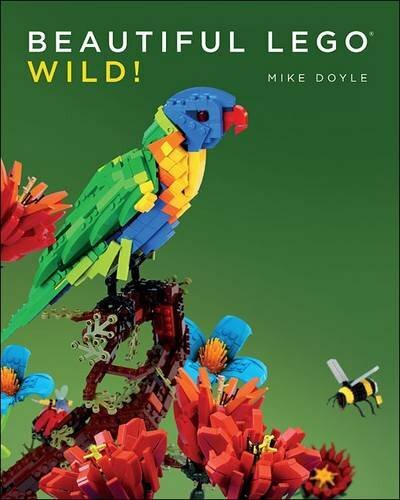 Artist, author, designer and builder Mike Doyle is back with another Beautiful LEGO book. Nature and animals are the focus in this third book of the excellent series. Mike has built some splendid creations, and curated MOCs from all around the world and from builders from all walks of life. All put together in a lovely presentation by No Starch Press. It's LEGO eye candy of the highest order, in a quality book that would look great on any coffee table. Like the first two book, this one is the quality we've come to expect from No Starch. It's perfect bound (square, glued binding) with a heavy double folded card stock cover, matte in finish except for the title and photos on the back, which have a subtle and appealing semi-gloss finish. The design fits perfectly with the first two and they look great together on the book shelf (well, at least the first one and this one does, for some reason Beautiful LEGO Dark is missing from my shelf, and looking back I didn't review it, I have no excuse). The pages are heavy paper, with sensationally presented photos and minimal text in a nice readable font. The book is organized by category, starting with landscapes and architectural models and moving on to flowers, birds, creatures, wildlife and animals of all nature (and fantasy). There are also featured artists Sean Kenney, Tom Poulsom and Pascal Schmidt. The creations are as diverse as nature itself, and run the gamut from silly and bemusing to downright terrifying, but all wondrous and lovely. A great many of the creations in this book have been featured on this blog, and I'm happy to call a lot of the builders friends. I realize this probably skews my perception of the book, but I'm as big a fan of their work as people that have never shared a meal with them. It should be pointed out that this isn't just a bunch of photos downloaded from Flickr and assembled. Mike Doyle is a graphic designer, and takes great care to present the models in their best light. Even going so far as editing the photos for optimum quality and altering the background colors to excellent effect. The result is pages that pop and content that flows. As you thumb through the book it flows effortlessly from one genre to the next. My only minor gripe is at odds with one of the things I really like about the book, the binding. While it makes it look great on the shelf and feel quality in your hands, it also makes it hard to get a good look at the pictures sometimes. It also makes it nearly impossible to read with one hand, on a table while enjoying a cup of tea for instance. It's always determined to get itself closed, and it feels like you're damaging the book to override this instinct. But like I said, it's a minor gripe. Since you're reading this blog in the first place I know you appreciate awesome LEGO creations. So I can confidently say if you like the things we feature here, you're going to love this book. It's got a broad appeal, excellent design, painstaking curation and of course marvelous models. But most of all, it's beautiful. If you'd like this book please consider supporting BrickNerd by using this link to purchase from Amazon.